20:20 My name is Michael Seibel. I am a current YC partner. I started two companies. One was called Justin.tv, which I ended up selling to Amazon. The other was called Socialcam, which sold to Autodesk. What I want to do is break down and demystify the process of creating a pitch. What happens too often when I see companies coming to talk to me is that they don't know how to simply explain what they do or how to ask for money. That's basically what you have to do as a founder. We're going to go over four things. The first is your 30 second pitch. You need to be armed with this constantly. This is basically how you talk about your company. It's magic. Whether you're talking to people who want give you money or don't want to give you money, this is your go to. 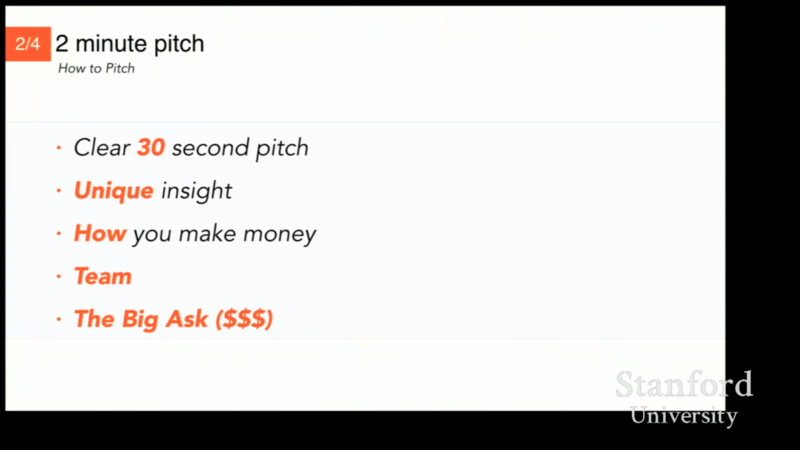 The second is your two minute pitch. This is for people who are more interested. This is people who you might want to raise money from or people who you might want to get hire. People with whom you need to get a little bit deeper. Notice that's where I stop. A lot of people practice ten/thirty minute pitches or hour pitches. That's all garbage. You can get everything you need done in two minutes. One thing I like to tell founders is the more you talk, the more you have an opportunity to say something that people don't like. Talk less and it will probably be better. I want to tell you about when to fundraise because I think a lot of companies get this a little bit wrong. And then quickly how to to set up investor meetings. 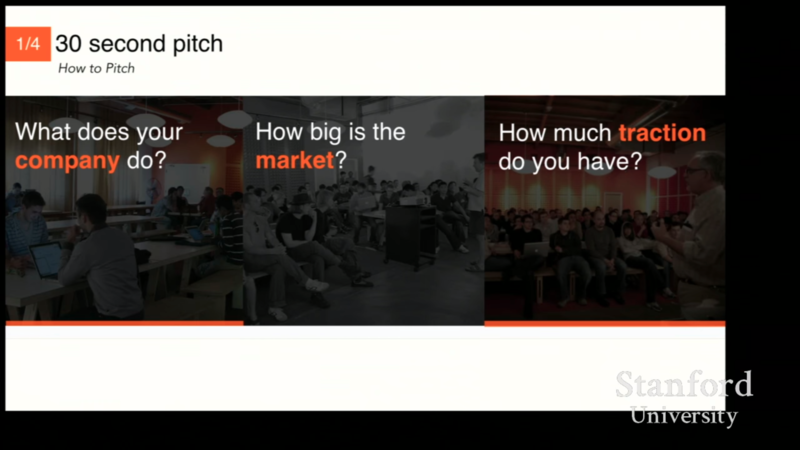 The 30 second pitch is so simple. It's three sentences. You can take your time. You can breathe when you do this. You don't have to get that much information out. The first is one sentence on what your company does. Everyone I meet for the first time screws this up. You have to be able to do it in a way that is simple and straight forward, that requires no further questioning on my part. You have to assume I know nothing. Literally nothing about anything. This is how you make it super simple. What we tell people is apply the Mom test. If in one sentence you cannot tell your mom what you do, then rework the sentence. There is a one sentence explanation that your mom or your dad is going to understand. So really, really start there. It's ok if you use basic language. It's ok if you say, "Hey we're Airbnb and we allow you to rent out the extra room in your house." That's simple! You don't have to say, "We're Airbnb and we're a marketplace for space." I don't know what that is! That's going to require more time. Use simple language, it's very important. The second is, how big is your market. It makes sense to do a couple hours of research out what general industry your product is in, figure out how big it is. Investors like to hear that you're in a multi-billion dollar market, it's pretty simple to do this. You know Airbnb might say, "How big is the hotel market? How big is the vacation rental market? How big is the online hotel booking market?" These are simple numbers to look up on Google. It makes an investor understand, "Oh wait. If we're big, if we really blow this company up, it could be worth billions of dollars." Don't skip this up. Second sentence. How big is your market? Third sentence, how much traction do you have? Ideally this sentence is saying something on the order of, "We launched in January and we're growing 30 percent month over month. We have this number of sales. This amount of revenue. This number of users." Very simple. If you can't speak to traction because you're prelaunch, you need to convince the investor that you're moving extremely quickly. "The team started working in January. By March we launched a Beta. By April we launched our product." Convince the investor that you guys are moving fast and that this isn't some long slog. You guys aren't thinking about this like a big corporation. You're thinking about it like a startup where you can move fast and make mistakes. That’s all you have to do in 30 seconds. Three sentences. From that basis you should be able to start a conversation about your company. From that basis I understand exactly what you do. You have no idea how valuable it is to be able to explain to someone what you do in 30 seconds. Internalize that. If you take nothing else away, that's going to help you. Ok. Two minute pitch. Now you got someone you actually have to convince of something. Maybe even someone you have to ask for money. So I like to add four additional components. And these also go by very quick. The first is unique insight. Now if you talk to VC's they'll say stuff like, "What's your secret sauce? What's your competitive advantage? What's unique insight?" It's all the same thing. When I think about unique insight, what I think about is here's your opportunity to tell me something that I don't know. Here's your opportunity to tell me something that the biggest players in the market you're trying to enter don't understand. Or don't do well. This is the AHA moment and you better have it down in two sentences. The AHA moment. So you got to crystalize all the reasons why you guys are going kill the competitors or the really intelligent thought that got this business started in two sentences. And I need to AHA. You can see whether it's happening when you're saying it. That's why I like two sentences so you get in and out fast. So if I look at you and I'm like, "Huh." Then it's ok. You nailed it. If I look at you and I'm like, "I already knew that." Then you didn't nail it. If I looked at you and I just don't understand what you're talking about you definitely didn't nail it. So practice that unique insight. In your two minute pitch that's all you’re going to get - you're only going to get two sentences to get that out there. So it can't be complicated. And that's basically the theme of this whole thing right? It cannot be complicated. Next - how do you make money? You know your business model. I see so many founders run away from this question because they think things like if I say advertising people are going to be like "Oh that's stupid." Just say it! Don't run away. If it's advertising - say advertising. Facebook's a massive advertising business. So is Google. If it's direct sales - it's direct sales. If it's you know a game and you're selling in app add ups - like that's fine. Just say it. Don't run away from the sentence. It only has to be one sentence long. Where founders get tricked on how you will make money is they say, "Well - we're going to run advertising. Maybe some virtual goods. We're going to figure out how to this. And maybe this. And maybe this." Well now you're saying nothing. Now you've told me you have no idea how you monetize this. This was a check mark that I just wanted to write. And then I am going to monetize it - instead I am writing a big question mark. So do the thing that everyone else your industry does to monetize 95 percent of the time - say it and move on. Like it's totally ok. No one’s going to hold your feet to the fire and say three years later you didn't monetize this way. But it's much better to be clear and concise than it is to start spouting out every single way your company can make money. Then next one is team. I think that this answer is actually really clear. I think you're trying to do two things. If your team has done something particularly impressive - you need to call that out. "We were the founders of PayPal." Probably want to say that. "We were the founders of Amazon." Probably want to say that. So if you guys have done something that is made investors money. You want to say that. If not, then please don't go on about the awards your team has one or the PhDs - I don't care. I don't care. What we want to hear is how many founders. Hopefully between two and four. We want to here is how many them are technical? How many engineers versus business people. Hopefully it's fifty/ fifty or more engineers. We want to hear is that how long have you guys known each other? We don't want to hear that you guys met a founders dating event three days ago. Ideally you've known each other either personally or professional for at least six months. We want hear is that you're all working full time. It's really helpful. We're all committed to this business. And what we wanna hear is how you met. That's it. You can get in and out of that two sentences very easy. Your only way to build credentials is if you have accomplished something. And with an investor, typically if you accomplished something that's made someone some money. So don't try to over inflate yourself if you don't have that stat on your resume. Move on. The more you talk about a bad thing - the worse it looks. So the last one is the big ask. When it comes to this, you have to figure out whether this is a conversation involves fundraising or not. What I tell people is like this is the time where you kind have to know what you're talking about. This is a time where you have to know are you raising on convertible note. Are you raising on a safe. You have to know what the cap of that safe is. You have to know how much money you're raising. You have to know what the minimum check size is. These are things where if you don't know these things, investors going be like, "These guys aren't serious. Or they haven’t done their homework." So where's the rest of this whole thing you shouldn't use any jargon. This part you shouldn't just be like "Oh we're just raising some money." Now is time to actually use a little bit of that jargon. If you don't know that jargon - Google search it. Like it's real simple. You'll guys learn it fast. That's it. That's all your pitch. Done. Game over. Now you let them talk. When to fundraise? This is important. You've got this little growth graph here. Investors like to invest based on traction. 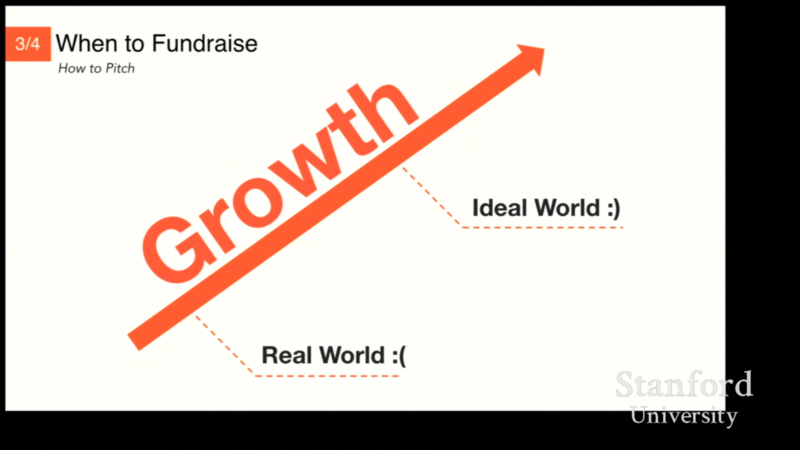 It is literally always better to raise money when you have more traction than less. Often times though, you will be in a situation where you're just starting or you just launched. What you need to do is you need to think about: how you flip the equation. Your entire mindset should be: you are the ones asking investors for money and therefore they are strong and you are weak. How do you create a scenario where you are strong and they are weak? That's where you want to be fundraising. First, how do you know that you're strong? If investors are asking to give you money, you're strong. That might be a good time to start fundraising. If investors aren't asking about giving you money, are you talking to people about your start up? Or are you running super stealth? If you're talking to people about your start up and you're getting the word out, either through the press or just through talking to your friends or people you know doing startups, that's a good way to start feeding that. The second this is, have you created a plan so that you can launch and grow without needing to raise a bunch of money? 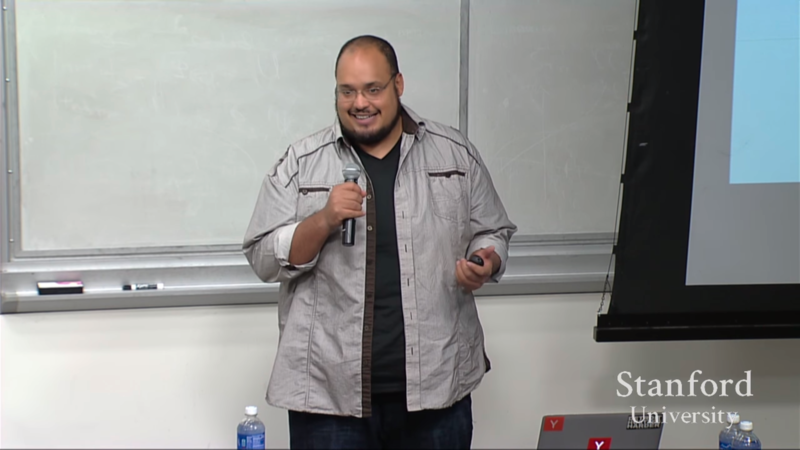 95 percent of the startups that I meet can get a product to market with a very little bit of money. Never put the investor in the ultimate position of power. "We can't do anything until you give us money." You always want to flip it around. You always want it to be, "This thing's moving. We all left our jobs. We're all working full time and it's moving. If you want to jump on, great. If not, there are a lot of angel investors." That's the attitude you want to have. That's the confidence you want to have. If you need money early, always plan on needing less money. Always be able to show that you've got a fully committed team that's working fast. That's going to be how you gain an advantage when you can't show traction. If you can show an investor that you haven’t launched yet but you've done eight months of work in one month or two months and you've got a great team that have all quit their jobs and they're totally committed, then you get some advantage back. You don't get all of the advantage unless you have launched and are growing. 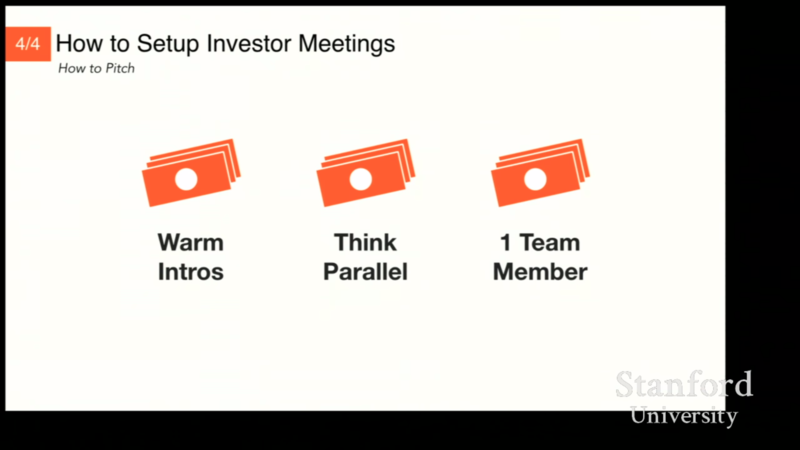 Finally how to set up investor meetings. This is really, really simple but I'm surprised at how many companies don't get this right. The first is you want a warm introduction from another entrepreneur preferably. Or a previous investor of yours. That's where you want to start. If someone who's passed on your company as an investor, offers you to make introductions– that's kryptonite. Don't touch that. So first warm introduction. Very simple. You don't want to cold call these people. You don't want to bum rush these people. The person - the credibility of the person who is introducing you to an investor is big part on whether the investor will take that meeting. Second, think in parallel. So many people that I meet will run the fundraising the super slow process. We met with one guy this we. We're going to schedule a meeting with another guy next week. Another guy three weeks from now. When you're fundraising you're on. It's a sprint. It's not a marathon. So you want to schedule all of your meetings during the same week. It's extremely hard to do but here's one trick that I love - tell when you're emailing investors you getting those warm intros the investors email you back you say, "Hey we would love to set up a meeting but we're building like crazy for the next two weeks. So can we set it in that third week?" Right? So then you've emailed everyone that. Right? So everyone schedules that meeting three weeks out. It's better for them because their calendars open. It's better for you because you've got all you meetings in one week. And also what did you do? You hinted, "Hey. I am not desperate for the money. We're building. Like I can meet you in three weeks but we're building. We're busy." Like it's signally all of the right things. So, that's the best way to kind of go about how you're gonna do that. The last thing is one team member should be investing in fundraising full time. It shouldn't be something that takes over the whole company. Because it's very, very distracting.